OSHA has developed a collection of compliance assistance resources to address falls in the workplace, the leading cause of worker fatality in the construction industry. The Agency says its goal is to promote awareness about common fall hazards in construction, educate job creators and workers on fall protection, and reduce the number of fall-related injuries and fatalities. OSHA explains that falls can be prevented if employers plan ahead to ensure the job is done safely; provide the right equipment; and train workers to use the equipment safely. Information on the sixth annual National Safety Stand-Down to Prevent Falls in Construction to be held May 6-10, 2019. The weeklong outreach event encourages employers and workers to pause during the workday to discuss fall hazards and how to prevent them. A series of fall safety videos showing how to prevent construction-related fall hazards from floor openings, skylights, fixed scaffolds, bridge decking, reroofing, and leading edge work. OSHA’s Fall Prevention Training Guide, which provides a lesson plan for employers including several Toolbox Talks. Fact sheets on ladders and scaffolding which provide guidance on the safe use of these types of equipment while performing construction activities. A brief video, 5 Ways to Prevent Workplace Falls, encouraging employers to develop a fall prevention plan, and to provide workers with fall protection and training. 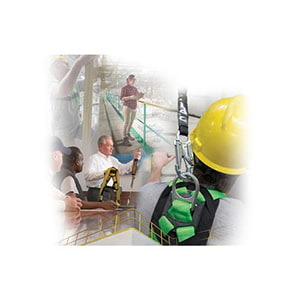 J. J. Keller's Fall Protection for General Industry - Online Training Course is designed to help learners understand OSHA fall protection requirements under the Walking-Working Surfaces rule.